A new data report released today shows that voters have raised taxes by $9.7 billion in school referenda in the last 19 years. The analysis, released by the Wheeler Report, provides an extensive look into the history of referenda since 1999. The data report shows that the percentage and dollar amount of referenda passed is increasing. That’s a shift away from earlier years, when referenda were far less likely to pass, and tended to be for smaller dollar amounts. For the first half of 2018 through July 1, 85 percent of 71 referenda passed, totaling $603 million. By comparison, in 1999, 46 percent of 167 referenda passed. In that year, more than $1 billion in referenda-driven tax increases were approved by voters. School districts operate under state-imposed revenue limits that are meant to protect taxpayers from continually-increasing property taxes. However, districts may ask voters to raise taxes either by issuing debt, or approving continual or one-time spending increases outside of regular limits. The question of raising property taxes falls on locals’ shoulders – but the burden of paying extends beyond the boundaries of each school district. All increases go into the statewide revenue formula, affecting taxes statewide. In the 2017-19 budget, Gov. Scott Walker increased state school aids funding by $636 million, the largest level of funding in actual dollars in state history. “Districts are asking for more money less often,” per the Wheeler Report’s analysis. Since entering office, the Walker administration has made property tax control a priority. Following recent reforms, districts can propose referenda only during regularly-scheduled primary and general elections. In the past, districts could offer referendum questions during special elections, and could also propose the same project in consecutive elections. Reforms led by Walker and the state Legislature have limited referendum questions to election days where more voters are likely to participate. The data release also breaks down the history of referenda by type. 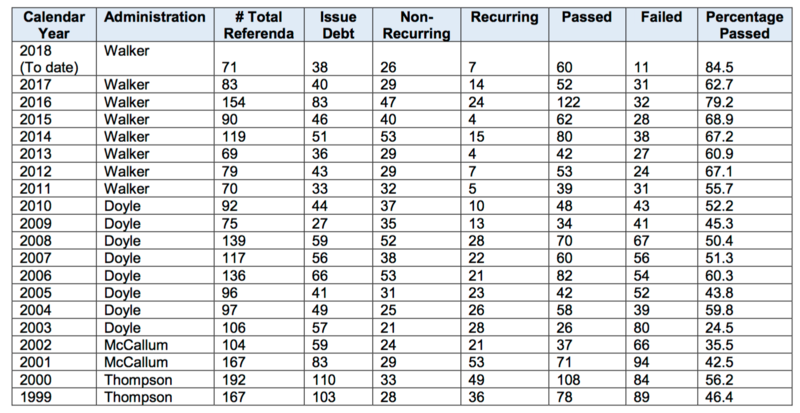 Referenda to issue new debt are the most common type of ask. Both the average and medians of all debt-issuing referenda have steadily increased since 1999. Through July 1, 2018, a total $596.8 million new debt referenda have passed. The average of all new debt referenda passed so far this year is $15.7 million. Read the full report at the Wheeler Report.